Maverick Steel worked with Mesa Properties on this 281,788 sq.ft. Design-Build project. The entire project consisted of a parking garage, customer service center, and kiosks. The building was designed with 24 gauge standing seam roof panel, vertical and horizontal architectural wall panels, and ExTech translucent wall panels. Maverick Steel was the General Contractor on this 9,600 sq.ft. Design-Build office and maintenance shop. The building was designed with insulated wall panels, vertical and horizontal architectural wall panels, and Simple Saver roof insulation. The office area consisted of 1st and 2nd level offices, a breakroom, a mechanical room, and restrooms. Maverick Steel worked with DSP Builders and American Steel on this 217,032 sq.ft. warehouse. This building had numerous interior columns, a 32' eave height, 1330 lf of translucent wall light panels, and over 4,000 lf of crane runway beams. With over 20 men on this job, we were able to get this project done several days ahead of schedule. 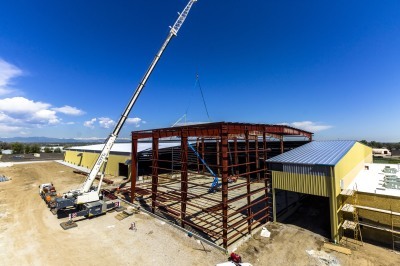 Maverick Steel joined forces with dcb Construction in the erection of almost 700,000 sq.ft. of parking garage. The building was designed with 24 gauge standing seam roof panel, hidden fastener wall panel and ceiling liner panel. Maverick Steel partnered with GH Phipps Construction on this 21,000 sq.ft. expansion project. The structure consisted of 2.5" insulated metal wall panels and 24 gauge standing seam roof panel. Maverick Steel provided and erected this 87,500 sq.ft. B&C Steel building at the Phillips County Fairgrounds in Holyoke, CO. 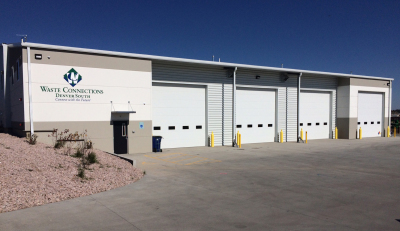 This building had numerous walk doors, windows, overhead doors, and a 40' x 18' HP door, all provided and installed by Maverick Steel. We are pleased to say we finished this project 2 weeks ahead of the county's required completion date.